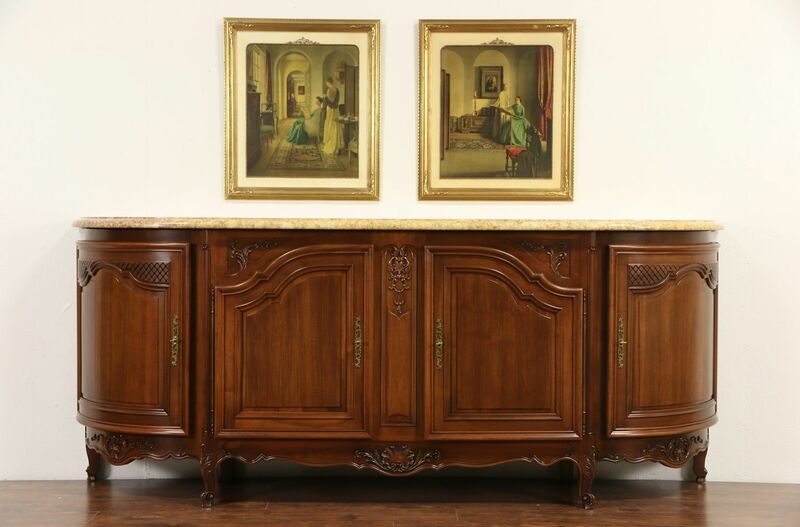 A magnificent and grandly scaled sideboard, server or buffet was carved of solid fruitwood in France in the 1940's. A thick shaped original rose marble top has minor scratches and wear, see photos. Elegant detailing, deep moldings and carving with raised panel doors has been enhanced with a restored finish. This European vintage furniture can be disassembled if needed for moving. Giant hinges, hardware and working double throw locks are all original, there are silver drawers inside. Dimensions are 8' 7" wide, 24" deep and 42" tall. See 30 photos on Harp Gallery website that enlarge to full screen size.